City entertain Barnet tomorrow at Deva Stadium (15:00hrs) looking to clinch their first points of the season. Manager Simon Davies has a fully fit squad to choose from. Trialist Eddie Johnson will not feature however as the club are still unable to sign new players after reaching the salary cap limit. The 23-year-old Chester born player is a free agent having been released by Branford City in the summer and has been training with the squad for about three weeks. Like City, The Bees have also had a point-less start to the new campaign with home defeats to Chesterfield (3-1) and Brentford (1-0) together with a 3-1 loss at Rochdale. Manager Paul Fairclough will be without defender Kenny Gillet through suspension but Ashley Carew has fully recovered from a back injury and is available to play. Forms for the 2008/09 competition are available to download from the link below. The closing date is 30 September. It’s just one win in 16 games now for manager Simon Davies who saw his side beaten again on Saturday. City’s defensive problems were there for all to see as they conceded in the opening minute and shipped two more goals before the break. A goal from Kevin Ellison midway through the opening period briefly gave City hope but there was to be no way back after the break. It's clear that the City defence, which has now conceded 16 goals in the opening four matches of the season, is in desperate need of strengthening but with time running out before the transfer deadline it remains to be seen who, if anyone, is signed. Wright has had two spells in charge at Chester. He was first appointed manager in January 2002 and led the Blues to the Conference title two years later before walking out on the club the day before their Football League return. He returned to manage in February 2006 following the departure of Keith Curle but was sacked, along with his assistant Graham Barrow, in April 2007 after a poor run of results saw just three wins in 20 matches. If signed in time striker Eddie Johnson could make his debut against Rotherham United tomorrow. The 24-year-old Chester-born player scored against an Everton reserve side in the week and City manager Simon Davies is hoping to complete his registration in time for the weekend game in Sheffield. The Blues make the trip to Sheffield tomorrow for their League Two fixture against Rotherham United. The Millers are currently exiled at the Don Valley Stadium folowing a dispute over the rent of Millmoor with the landlords. Rotherham started the season on minus 17 points after failing to come out of administration. They have got off to the perfect start as they attempt to claw back the defecit with wins in their opening two league fixtures at home to Lincoln City 1-0, and at Morecambe 3-1. Between those two victories hey also chalked up a memorable Carling Cup win over neighbours Sheffield Wednesday following a penalty shoot out. Manager Simon Davies’ only concern appears to be a hamstring injury that Ryan Lowe has packed up in training. The club have re-entered the competition this season and are already through to the semi-final after receiving a bye in the opening round. They will now face either Stockport County or Crewe Alexandra. A Chester City X1 played a behind-closed-doors friendly against an Everton Reserve side at Deva Stadium today and drew 1-1. Trialist Eddie Johnson was on the mark for the Blues. The club have approached Wayne Allison to help out with coaching. He is expected to replace assistant manager Huw Griffiths who was sacked last week. Yorkshire-born Allison began his playing career in 1987 as a trainee at Halifax Town before moving on to Watford, Bristol City, Swindon Town, Huddersfield Town, Tranmere Rovers, Sheffield United and Chesterfield. The club will be looking to fill the assistant manager’s role this week after yet another home reverse on Saturday, The lowest Saturday Deva crowd since City returned to the Football League, just over 1400, witnessed the third defeat in seven days as Chester’s terrible start to the new season continued. If they weren’t already, the alarm bells must be ringing following such a poor turnout, and with only two home wins since the new year it’s not surprsing that supporters have become disillusioned and are voting with their feet. The latest defeat at the hands of Wycombe Wanderers did see an improvement on the efforts of the previous seven days, but despite playing some neat football at times, players were easily brushed aside by a much stronger team who themselves had not registered a win in their opening two games. The youth team kicked off their Youth Alliance season today with a 2-0 defeat away to local rivals Wrexham. Assistant manager Huw Griffiths as been sacked by the club following an incident with an unnamed player at half-time in Tuesday’s game against Leeds United. 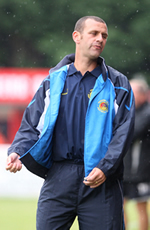 Griffiths was only appointed in May having previously held a similar role at Southport and played with manager Simon Davies at Bangor City. but was dismissed last night due to “unacceptable actions”. The club will not start to look for a replacement until next week. Peter Taylor brings his Wycombe Wanderers side to Deva Stadium tomorrow for a League Two clash, kick-off 15:00hrs. The Chairboys have had an indifferent start to the season with a 1-1 home draw against Morecambe followed by a 4-0 Carling Cup reverse against Birmingham City. City manager Simon Davies is expected to start with youngster Shaun Kelly (pictured) in the centre of the defence after the former youth team player impressed when coming on for Paul Butler on Tuesday night. Fellow central defender Paul Linwood is expected to start alongside him despite still suffering with a back injury. City’s defensive frailty exploited by Dagenham on Saturday was exposed to a far greater audience in last night’s televised Carling Cup match with Leeds United. The Yorkshire side put five goals past John Danby in the opening 35 minutes with Jermaine Beckford bagging a hat-trick as the League One side eventually ran out 5-2 winners. Ryan Lowe scored both City’s goals either side of the break. City needed to get off to a tight containing start but found themselves a goal down in three minutes as Beckford turned Paul Butler ten yards out to turn a long punt upfield from Ankergren past Danby. Ryan Snodgeass doubled the lead on ten minutes before Lowe saw a deflected shot loop over Ankergren to claw City back. Beckford restored the two goal advantage with a well struck curling left foot shot before Andy Robinson added the fourth on 31 minutes. Four minutes later Beckford completed his hat-trick with a sublime finish after City had once again been caught in possession. A foul on Damien Mozika, who once again turned in a good performance, 15 minutes from time gave Lowe the opportunity to complete the scoring from a spot-kick, which he did. The Blues will be looking to put Saturday’s disastrous start to the season behind them as they welcome League One side Leeds United to Deva Stadium tonight. The all-ticket match kick’s-off at 19:45hrs is being screened live by SKY. Manager Simon Davies will no doubt be looking to make changes to the side that suffered the heavy defeat on Saturday. The sides have met before in the League Cup. Back in 1974/75 the then League champions came to Sealand Road for a fourth round tie and were beaten 3-0 in arguably the clubs greatest ever victory. Those in the sell-out 19,000 crowd that night will never forget the game, as two goals from John James and a third from Trevor Storton brought a victory for the fourth division outfit that shocked the footballing word, and brought national back page headlines the next morning. In 1983/84 the two sides met in a second round Milk Cup tie with the tie being played over two legs. Again Chester caused a shock with an Andy Elliott goal bringing a 1-0 win at Elland Road. However the Blues were beaten 4-1 in the Sealand Road return, Peter Zelem scoring the consolation goal for the Blues. More recently in 2006/07 the sides met at Elland Road in the first round and a single goal from Erik Bakke gave the Yorkshire side victory. Chester got off to the worst possible start to the season on Saturday with a six goal drubbing at Dagenham & Redbridge. Manager Simon Davies (left) predicted a tough game and he certainly got that. The cause wasn’t helped with the very late withdrawal just before kick-off by captain Paul Linwood, his absence highlighted the alarming lack of cover in that position with Kevin Roberts being asked to play out of position to fill the role on day. The one bright point of the day was the debut of Damien Mozika who ran all afternoon and was City’s best player by far. The home side took an early lead through a Dominic Green free-kick on 16 minutes and doubled their advantage from a Ben Strevens penalty three minutes before the break. Home goalkeeper Tony Roberts ensured the two goal interval advantage with a flying save from an Anthony Barry header. The home side extended their advantage as a long range Sam Saunders free-kick was allowed to sail right through the City backline and past Danby. A terrible mix-up between Danby and Paul Butler allowed Saunders to add his second and dagenham's fourth. At the other end City created two good chances themselves with Richie Partridge shooting straight at Roberts when he had been sent though and substitute Paul Taylor headed straight at the ‘keeper from six yards out after a pin point cross from the left wing. The home side added a fifth with a deflected shot from Paul Benson 11 minutes from time and the rout was completed in the last minute as substitute Mark Nwokeji scrambled the ball over the line from close range. Manager Davies now has the unenviable task of picking his players up before tomorrow night’s all-ticket live televised Carling Cup tie with Leeds United. Whether Linwood will be fit to return to the side remains to be seen. City travel to Dagenham & Redbridge tomorrow as they kick-off their 2008/09 League Two campaign. Victoria Road is not a happy hunting ground for City with two draws and three defeats in their previous five visits. Their last visit in February resulted in a shambolic 6-2 defeat that cost assistant manager Jimmy Bone his job 24hrs later. The Blues will go into tomorrow’s game determined to put that performance behind them. The Blues have been given a bye in the first round of the Johnstone’s Paint Trophy. Other teams in the north west section to receive a bye are Bury, Rochdale and Carlisle United. They will now enter the competition in round two which will be played during week commencing 6 October. Former Bradford City defender Eddie Johnson has been training with the Blues and it’s possible that the Chester born 23-year-old may sign a deal before the weekend. Johnson had interested manager Simon Davies earlier in the summer but Johnson chose to have a trial at Crewe Alexandra. The Railwaymen didn’t offer the utility player a contract however. Tickets for next Tuesday's Carling Cup round one clash with Leeds United are still on sale. Supporters can pick their up from the ticket office at Deva Stadium today and on Monday between 10:00-16:00hrs, and also from the new club shop at the bottom of Watergate Street. NEW SIGNING ON THE WAY? Manager Simon Davies has hinted that there may be another signing in the next day or so as he finalises his squad for the coming season which starts at Dagenham on Saturday. He is reported to be having talks with two players today and is hopeful of offering one of them a contract. Chester lost their final pre-season friendly 4-1 at the hands of AFC Telford United on Saturday. Midfielder Anthony Barry scored the consolation goal from the penalty spot seven minutes from time. Chester City: Sanna, J.Vaughan, Rule (Wilson 75), Hughes, Roberts (Kelly 46), Taylor, Harris, Barry, McManus, Mannix (Owen 71), Mitchell (Ellison 82). Chester lost by the odd goal in five as their pre-season campaign continued with a home defeat against Swansea City last night. The Blues found themselves a goal down in the opening minutes through Darren Pratley before the Swans doubled their lead before the interval as substitute Stefan Morrison converted. Manager Simon Davies made four changes during the second period and saw his Blues side battle back with two goals from summer signing Jay Harris bringing the sides level with six minutes remaining. Parity lasted only a minute though as Marcos Painter capitalised on a defensive error to score the winner. City have just one more friendly at AFC Telford United on Saturday before the League Two campaign kick’s-off at Dagenham seven days later. Chester City: Danby, Roberts, Wilson, Dinning (Harris 58), Kelly, Butler, Partridge, S.Vaughan (Mannix 45), Lowe (McManus 86), Mozika, Ellison (Taylor 79). Good luck to forward John Murphy who has completed his move to St Patrick’s Athletic for an undisclosed fee. Murphy began his career in 1995 as a trainee at Chester City before moving to Blackpool four years later where he scored 103 goals in 270+28 appearances for the Seasiders. In 2007 he moved to Macclesfield before re-signing at Chester last summer. Last season Murphy scored 9 goals in 39 appearances.